follow your heart. how do you want your kids to remember you, when you had to deal with adversity? it's one small year out of the rest of your life. you can do this. have faith. ...only a few of the words of support that have recently been shared with me, as we continue to discuss, plan, flip-flop, consider and reconsider. even though i shared that it was official that steve is going to KS by himself, we still have one more day of hope--as steve is calling tomorrow to tell the landlord if he's renting or not (steve had found a rental house and gathered two other geo-bachelor roommates, to live together in town). so my mind has been absolutely consumed with thoughts regarding should we stay...should we go. trying to figure out what's right. what is best. and making myself sick with scenarios. is it possible that my heart could be split in two--a side that believes it's best to stay and the other that believes it's best to go--each side beating equally as strong, but in complete opposite directions. and are my heart and gut one in the same? i've never quite felt this way. just sick with not knowing. i wish i could simply follow my heart. i wish it was that easy. but it's not. steve and i talk to one another about the situation multiple times a day. and talk with the kids, that we're still having a hard time deciding. we're open with them...that this is hard. really, really hard. 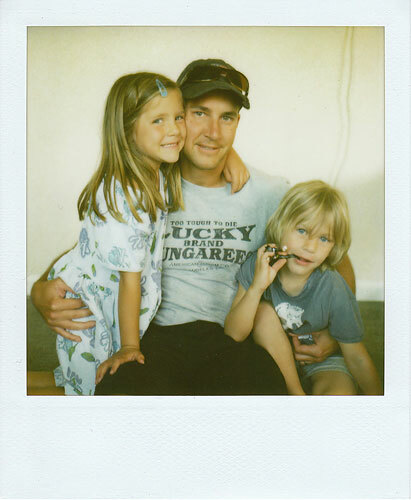 i close with a quick polaroid i took of steve and the little ones yesterday.